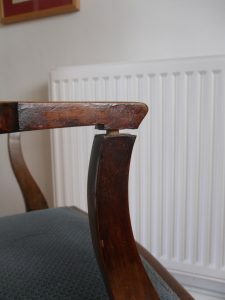 This end of the XIXth century chair was brought to me as it was wobbly from the joints being dried up and unglued, and the finish was looking dull. 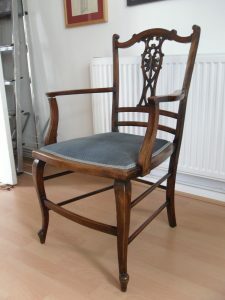 I revived it by regluing the joints that needed it, recoloured it partially, and finished it with a couple of shellac coats, as well as some waxing for a harden and shiny finish. My customer was delighted when I brought it back to her. See her testimonial at the bottom of this page. 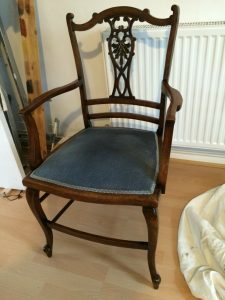 Thank you so much for all the work that you have done on my almost 200 year old chair. 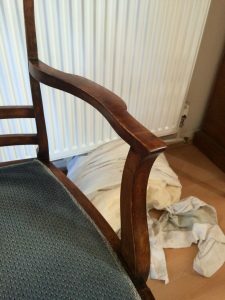 It has been and still is, a very much loved piece and prior to your renovation was rather decrepit. It is now looking beautiful in my lounge instead of being hidden away in a bedroom. I am so lucky to have found someone that I liked on the first meeting and can trust.